Best known for his ideas relating to evolution, French naturalist Jean-Baptiste Lamarck (1744-1829) first built his reputation as a botanist and was elected to the prestigious Académie des Sciences in 1779. His career took a new turn in 1793 when he was made professor of 'insects, worms and microscopic animals' at the Muséum National d'Histoire Naturelle, although he lacked prior knowledge of the subject area. Undaunted, Lamarck set out to classify organisms which few naturalists had considered worthy of study since Linnaeus. He was the first to distinguish vertebrates from 'invertebrates' - a term he coined - by the presence of a vertebral column. In this groundbreaking seven-volume work, published between 1815 and 1822, he arranges invertebrates into twelve classes, laying the foundations for the modern study of these organisms. 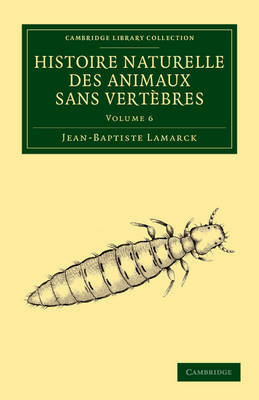 Volume 6, published in two parts between 1819 and 1822 (reissued here together), continues with the study of conchifera and covers molluscs.